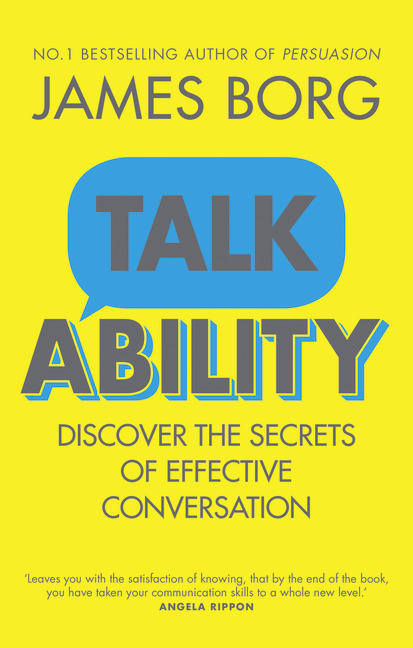 A new book from James Borg – on what to say and how to say it – so you can get more from the way you talk. All the day-to-day conversations that you have in your private and working life result in a particular outcome. How many times do you come away from a situation and think you could have handled it better? The realization that you should have used different words or said things in a different tone which might have produced a more positive result or avoided friction. How often have you felt frustrated at your inability to state your case and to explain your thoughts well enough for the other person to grasp your point? Make no mistake - talk is our most precious commodity. Human interaction and face to face communication came long before social media websites, e-mail and texting. Yet more and more people have lost the art of conversing effectively and successfully as the ‘screen’ replaces conversation. Talkability provides tried and tested suggestions to help you get your points across and make things happen. After graduating in London, with degrees in both economics and psychology, James Borg had a successful career in advertising, sales, marketing and journalism. This equipped him well for his current role as a work psychologist, business consultant and trainer in persuasion techniques, interpersonal skills and memory improvement. With his fascination for the human mind from a young age (he was admitted as one of the youngest ever members of The Magic Circle after his demonstration of 'mind-reading' and memory feats) he performed occasionally with a routine known as 'The mind and magic of James Borg'. Tuning in to other people's thoughts - and being aware of our own - is his prescription for success in all aspects of life. He's often invited on BBC radio and was selected as a Harvard Business Review author for May 2009.